There is a lot of technical info in the Gutekunst website, in English, that I strongly recommend to read, including the downloadable pdf. The tech info explains the importance of an ADC and the advantages of the Gutekunst ADC over the cheaper ADCs with simpler design. After reading it all, I got convinced of what I was missing, and that this was the ADC I needed, despite the much higher price. The design with plane plates of two prims each (in opposition to single prisms of other ADCs) is essential to a perfect dispersion correction, and as a bonus it provides a non-moving image during tuning, which is important in the same way a stable telescope is important for critical focusing. And the ADC tuning changes with altitude, so changing target means changing tuning, so it is important it is a very quick and simple operation. On top of the design we get premium optical and mechanical execution quality, so it becomes the right match for any premium telescope. The original professional version with 38mm clear aperture is too expensive at 6600 euro, but to my happiness Gutekunst was just introducing a smaller version with 28mm clear aperture, the ADC–Compact, at half the price, 3300 euro, and there it got in my price range. The ADC-Compact is identical to the pro version, only difference is the clear aperture. The ADC is to be used for hi-res, so clear aperture larger than 28mm is only required for very large observatory telescopes. So I went to contact Gutekunst to order it, and it only got better from there. First, Dr. Martin Gutekunst is very helpful, very clear with all the explanations, regarding the product and the interferometer tests he does with it before shipping. And he is fluent in English. Very highly recommended. 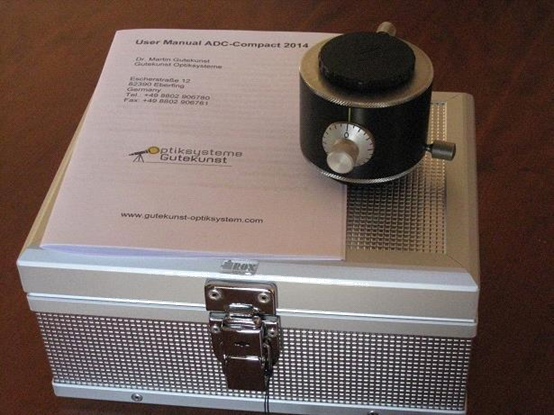 And then the ADC-Compact was in stock, so no wait time! This first run of ADC-Compact was 25 units. where I can load and play with the data files from Wolfgang Rohr, for all my optics: scopes, solar filters and other optics. So now the Gutekunst ADC joins the family. But we do not need AtmosFringe software, as Gutekunst send us screenshots from it, including wave surface, PV, RMS strehl, astigmatism, SA. And you get to check all the data and diagrams before actual ordering. Typical values are 99% strehl, mine was a little above that. So after a few days, I was receiving the ADC and ready for first light. The ADC is simple to use and setup, but it is important to consider the f/ratio to get maximum performance. The ADC, like the prism diagonals and binoviewers, is made of prisms, so we get optic dispersion at fast f/ratios. The binoviewers correctors are made to compensate this effect. We are aiming to eliminate atmospheric dispersion (AD), we do not want to introduce optical dispersion, even though optical dispersion effects are typically much smaller and less visible than atmospheric dispersion. Atmospheric dispersion varies with altitude, optical dispersion varies with f/ratio. In order to get best performance from the ADC, we should use slow f/ratios, preferably above f/10 or f/12, so unless you use such a scope, a barlow should be used if we want optimum performance. All devices with prisms perform better at slow /ratios. So it allows proper use of a prism diagonal. Prism diagonals are better for high-res observation, but require slow beam to avoid dispersion. Also with slow beam, there is no need for bino corrector. Barlowing extends back focus, so that there is room for ADC and binoviewer without corrector. A solid way to achieve the recommended barlowing is with the Baader/Zeiss system, based on T-thread connections, that includes VIP barlow and FFC barlow. In addition to the solid threaded connections, the mag factor can be adjusted by T-thread extensions. 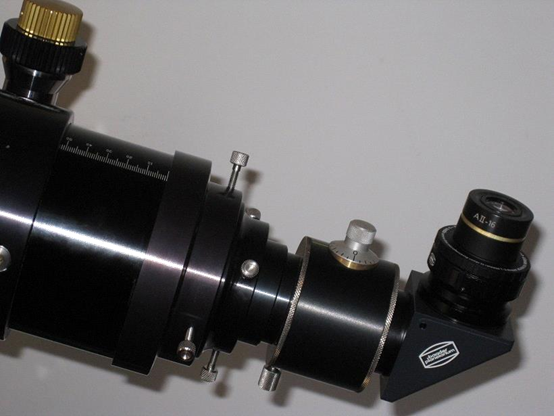 I have tried the ADC with Baader FFC, Zeiss barlow, VIP Barlow and Astro-Physics BARCON. All worked fine, but I prefer the FFC for the stronger mechanical connection (T-thread), slight better optical quality and higher magnification. For lower magnification the VIP also provides the same strong mechanical connection (T-thread). Another factor going for the FFC is that the beam gets collimated (as in a Powermate), in opposition to regular barlows that can make the beam divergent. To get minimal dispersion from the prisms, the beam should be as parallel as possible. Typically I use the FFC at 5x, with a pair of Zeiss 25mm aspherics. For higher mags, I could take the FFC to 8x, but I prefer to use a pair of ZAO 16mm. I love how the ADC-Compact integrates so well with Baader/Zeiss system (binoviewer, diagonal, FFC, etc) that it seems a component of the Baader/Zeiss system. The ADC mechanical mounting with T-threads on both ends is a perfect match to the Baader T-thread system, and the 28mm clear aperture of the ADC-Compact is a perfect match to the Baader/Zeiss binoviewer, also with 28mm clear aperture. The ADC also has rotating dovetails on both ends to allow setting the desired input and output rotation. The input dovetail is to set the tuning knob pointing up so that the prisms work on the same axis as the atmospheric dispersion. The output dovetail allows to set the diagonal angle different to the ADC, for convenient observing angle, or to set the desired camera orientation. The ADC has about 40mm optical length, so when replacing the ADC with a 40mm T extension tube the focus remains almost the same, which is nice for switching between “with ADC” and “no ADC”. The manufacturing quality is top-tier, having the black aluminum body and the stainless steel dovetails, as the Baader/Zeiss binoviewer does. 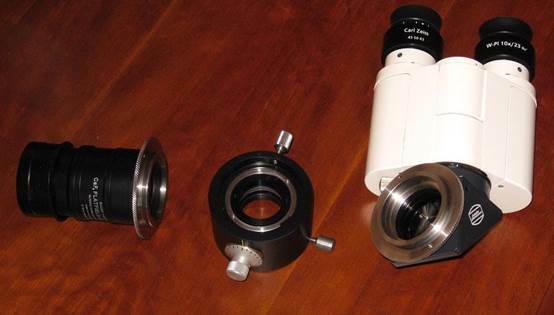 Some people do not like the Zeiss binoviewer dovetail because of the danger of accidental fall. I don’t see a problem there as you need to unscrew a lot in order for it come off. But in any case the ADC rotating dovetails are larger, so less prone to tilting, and require much more unscrew to come off, so totally safe, and in fact are not required to come off ever. The fact that they can come off with significant unscrewing is just a plus. I tested the ADC mostly on Jupiter, Saturn, Venus, Mars, the moon, and stars. Without the ADC, the blue top and yellow bottom fringes are very obvious at 45 degrees and still clearly visible at 60 degrees. Tuning that color out with the ADC seems like going from achro to apo. It is wonderful to be able to tune/set the ADC just with a single knob. We can concentrate on the observation only. And when it is tuned, it is pure sharpness. Great. The images in “why ADC?” (section on Gutekunst website) match my visual experience with the ADC. In that example we have Mars but the same effect occurs with other targets: color fringes on edges and disc detail blurred. Some people may not be so sensitive to color error. But the important thing to note is that the color fringe is not the main problem, it is just the tip of the iceberg. As in an achromat the color fringe is not the problem. The color fringe is just the proof that there is a problem all over the disk area, with color info bleeding all over each other and damaging the resolution. As each planet disc presents a common color/tone within all disk, we do not see an obvious color error, although it is there. We see it as a less sharp image, so it is not obvious what we are missing. Only at the edge where the color error bleeds over the black background, we see it clearly as color error. People sensitivity to the color fringe varies, but even if someone is not disturbed by the color fringe, that does not avoid the fact that the disc is getting blurred and resolution reduced. To my surprise the effect of the ADC with single stars is at least as obvious as with planets. Without the ADC the star gets a blue/yellow top/bottom, I did not pay enough attention to that before. With the ADC tuned, the color just goes away and the star gets sharper. For people using high mags on stars (e.g. double stars), the ADC is essential. I have been using the ADC mainly with the 175 f/8 apo, although I used it also with the 12” SCT. The ADC works very well with the 12” as well. In fact the ADC effect should increase with aperture, so the larger the aperture the more important the ADC gets. This is demonstrated in Gutekunst website. For my home planetary I prefer to use the 175 apo, and the ADC effect is quite large at 7”. The ADC shined during the recent Jupiter triplet shadow transit. The event lasted several hours and went progressively low in altitude with time. Without the ADC it was like using an achromat in the middle, and much worse near the end. As the satellites color are similar to Jupiter color, without ADC the satellites were not clearly identified over Jupiter disc. With the ADC Jupiter was absolutely color free, and the satellites and their shadows were very perfectly defined over Jupiter disk, real apo performance. Note I had to adjust the ADC every 30-60 minutes to match the changing altitude and therefore atmospheric dispersion. It was a wonderful and unique experience to able to follow the event till the end at low altitude and perfect and color free images. I felt privileged for being one of the few able to watch the event properly until the end, and very thankful to Gutekunst. Some time later I observed Venus and Mars on the same field of view. Given Venus and Mercury altitude restrictions, the ADC is even more important with those. Without ADC, Venus had yellow and blue fringes, Mars red and green fringes. With the ADC all fringes gone and the details on disk become more contrasty and more visible. Sometimes I miss not being able to tell in the dark the neutral position. A click-point could solve it. Not a big issue though. I go one side and the other to check for optimum position, just like I do for focusing the scope. Prism optics can provide better resolution and contrast than mirrors, when used in slow beams. However due to the plane surfaces they are prone to ghost reflections from bright objects. Usually this does not happen with bright light within the field of view, but only with bright objects outside the field of view, as light bounces on the side walls of the prisms. I already had these ghost reflections with my Baader/Zeiss prism diagonals and binoviewer on off-field bright objects: Jupiter, Venus, but very specially with the moon. When I want to fix this I put a baffle at the optics input (diagonal or bnoviewer). It reduces clear aperture, but for hi-res we never use it all anyway. For wider fields I remove the baffle. The ADC, also made of plane prims, also brings that potential problem. When I used the complete prism combo (FFC, ADC, prism diagonal, AD and binoviewer), I got severe ghost reflections from off-field light on the moon and some on Jupiter. There were already ghost reflections without ADC, but they increased significantly with the ADC. Note this only happens with very bright light sources (Moon, Venus and Jupiter) and only when the bright light source is ***OUTSIDE*** the field of view. With Venus or Jupiter we usually have them inside field of view, so this is only a problem with the moon, as its larger surface is both inside and outside the field of view. So I used a 15mm baffle at the input of the ADC, and it completely solved the problem for the complete train, ADC and all elements. Maybe a 20mm works as well, did not try it. A 25mm baffle has no effect. Having apo-optics is not enough if we have achro-atmosphere. That is why I called this review Apo-tmosphere, because that is what this ADC brings to us. Due to AD (Atmospheric Dispersion), a reflector or an apochromat become increasingly an achromat with decreasing altitude. With the ADC I realized my apo and SCT were not performing color-free most of the time. So this is the next step in color correction. I don’t have experience with the other cheaper ADCs, but from what I know of the design and implementation differences they can’t compare both on performance and operation (tuning). The dual prism pair optical design, the optical execution quality, the clear aperture and the superior tuning mechanism convinced me this was the one to get. Anyone that pays for a premium telescope should not dismiss this ADC. For value scopes, this price may be overkill, so the cheap ADCs may be a better match. For someone with quality apo or quality reflector, the Gutekunst is the way to go. The added performance it provides clearly justifies the cost IMO. Without a ADC, a premium apo or reflector will behave in some situations (30-45 deg Alt) as a simple achro, and in many situations (45-60 deg Alt) as a semi-apo. How much is that worth? Also the ADC can be used with the several scopes we have, apos, reflectors and CATs, so the cost effectiveness of the ADC should account for the total cost of all the scopes we have. The ADC Compact is easily my best spent money on astro-equipment, together with my APM/LZOS 175, both interferometer tested as 99% strehl. But as good as the LZOS is, there are other high-end APOs in the market, but there is no other high-end ADC. So it is a unique value. Optical design with two plane plates rather than two single prims provides perfect dispersion correction. Question (hopefully not a dumb one). 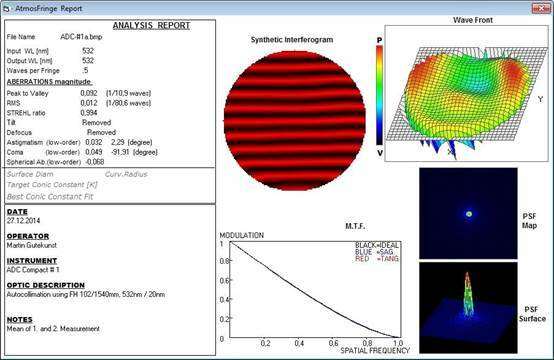 How can a reflector be affected by color dispersion? Do you see color fringes on objects when pointing a reflector near the horizon, or are atmospherically-induced aberrations expressed differently (loss of contrast and sharpness) in a reflector? Same in reflector/refractor. The effect takes place in the atmosphere, so the device we use to look at it makes no difference. Both are nice but filters can be employed to reduce the pass band which will limit the effects of atmospheric dispersion. Very good review of this product, thank you. Can this product also compensate for chromatic aberration in an achromatic refractor? If so it'd be worth it's weight in gold. Nope, they compensate in a linear direction from the top of the field to the bottom in a straight line, not from the center out in a circle. Using filters to avoid AD works the same way and as good as using filters to avoid chromatic error of achromats. That is, it is not the best way nor the best result. The problem with RGB photography is that the three components must be taken with little time difference. You cannot spend some minutes on each component. For visual you take all colors at the same time so filtering does not work at all. With an achromat the error is mostly on the end of spectrum, with AD the error is all over the spectrum, linearly. Of course you can be happy with a filter, but people have been happy all these years even with no filter or ADC. Hugh, it is as happylimpet says, the error is caused by the atmosphere before the light enters the telescope so it affects equally reflectors and refractors. But I redirect your question to you: don't you see color fringes when seeing moon or planets a low altitudes? Don't you see them better (more resolution, more contrast) when they are higher in the sky? You can try stars too. Michael, you are completely right, but also the distortion curve is different. The AD (atmospheric distortion) is linear, whereas the achromat distortion is not. The distortion could be radial with linear curve, but it is not. That is why I said above that achromat error is mostly on visual spectrum end(s) and AD error is linear all over the spectrum. Is there some sort of a Bahtinov-type-focusing-mask that can be used to fine-tune the focusing of an ADC? In my experience with such a device (close to two years now, with an Astro Systems Holland design), I have found the dispersion to be reproducible (for all intents and purposes) at any given altitude above the horizon. So what I did, over time, was to observe bright A0 stars at various altitudes (10 degrees, 20 degrees, etc.) and tune my ADC to compensate for the dispersion. I then noted how many "notches" on my dial I had set the adjustment for each altitude. Some versions of FireCapture had the ability to boost the saturation of a color cam, purely to aid in this purpose. So are the ADC filter worth the money or not???????? Great article/review - thanks for taking the time to write that up and post. I knew about the phenomenon of AD and always considered it to be something of a necessary evil; I didn't know there were products out like this there to help correct it. If you're seriously into planetary viewing and imagery it seems like a must have! That doesn't seem likely since the degree of refraction will depend on various things like temperature, humidity, etc, and will increase/decrease strongly depending on the altitude of the object. 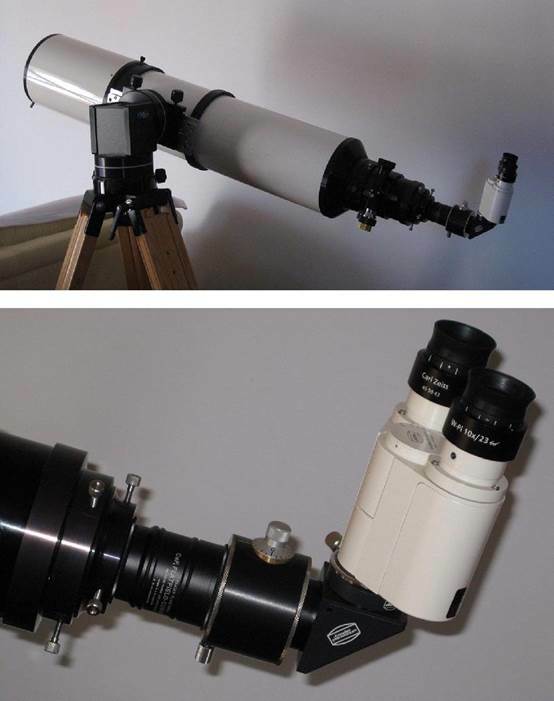 For high resolution planetary imaging definitely But rather ASH/PierroAstro cheaper ones. PiotrM, an ADC (any ADC) is at least as important visually as it is for imaging. Imaging you can still try to do a partial recovery by shifting RGB color planes. It cannot correct all error/blurring but it improves the result. But visually you are live with the universe, only way to correct it is with an ADC. With a bino, you're getting a lot of the correction already. If I look through certain eyepieces with my Denks, I can get color in my 152 Apo, because of the f ratio I think. Other eyepieces of different mm will rid the view of that color while still maintaining the same FOV with the PowerSwitch. The seeing is doing its thing and we are trying to do ours. If the seeing is bad, you're going to spend all your time turning knobs, not observing. A bino does not correct anything, at best it does not make more color error. A bino is intended to deliver as output an image as close as possible to its input. The only way to correct atmospheric dispersion (AD) is create a similar error of opposite sign, to result in zero total error. As the atmospheric error is dependent of altitude (being zero at zenith), no fixed device can correct for AD, it has to be tuned for the altitude. A device that nulls AD at low altitude will create color error at high altitude, and a device that nulls AD at high altitude will allow color error at low altitude. To reiterate, this device does nothing to correct any chromatic aberration which is happening in the scope. It only corrects that variable amount which the atmosphere contributes. There's probably less call to use it with an achromat than with an apo because the atmospheric dispersion is a smaller contributor to the total color than in an apo. Anybody else have one and know how they compare to the more expensive ones above? Thanks be to all who contributed to this interesting thread. Today, on twitter, I learned of the existence of "Fluid atmospheric dispersion corrector" by Jessica Zheng, et al. The elegance of this device is that it is simple, provides an essentially perfect correction, yet has no moving parts. The downside is that, so far, it is not available commercially. The article is available on the web in various places. Just "google" for "Fluid atmospheric dispersion corrector by Jessica Zheng" and you will get lots of hits. I got my article copy from the SPIE website. For those wanting an ADC in a hurry, and for a low price, the ZWO ADC from Highpoint looks like quite a good deal. Besides, Highpoint is a great vendor!